The needs of life and learning in the 21st century are changing rapidly. Technology project work can help us meet modern demands by providing students with opportunities to think critically, build creativity, write for a real audience, and manage time and effort. While technology project work helps students acquire these important skills, the end product of project is merely a snapshot of each student’s content knowledge and communication skill. A single deliverable doesn’t necessarily indicate how effectively students build and use problem-solving, thinking, and management skills during the process. Student-created digital portfolios can help us evaluate students’ growth with these skills. A portfolio showcases both student achievement and student learning over time. Rather than a basic collection of work students have completed in the classroom, an effective digital portfolio is a conscious selection of work along with student reflections and supporting materials that demonstrate progress, growth, and the learning that occurs during the project-building process. The process of developing digital portfolios transfers responsibility for the demonstration of learning to your students, helping to engage them in the process of learning and making them active participants in their education. Collecting and reflecting can be done without “going digital,” but technology makes this process easier than ever before. Unlike boxes of paper reports, dioramas, and audio tapes, a digital portfolio is easy to store, access, update, and distribute. It is a wonderfully rich way to share student ability with college recruiters, progress with teachers and administrators, and success with parents and community members. Applications like Share include authoring tools that make it easy for students to include documents they have created, support those documents with photos, videos, and audio tracks of their performances, and reflect upon the process using text and recorded narration. Digital portfolios allow students to share their accomplishments as HTML for use online or easy-to-share ePub documents or interactive PDF files. In creating a digital portfolio, students select from their body of work to demonstrate their progress toward academic goals as well as reflect on and explain their academic growth over time. Reflect content they are studying. Demonstrate progress toward academic goals. Indicate the development and use of a wide range of skills and abilities. A portfolio should include a range of student work. A portfolio is a celebration of learning, not just achievement. To make it representative of the student’s development, the portfolio should include examples of their best performances as well as work that demonstrates progress toward a particular learning goal. To help students better evaluate their own work and their own learning, each performance task in a portfolio should correlate to clear evaluation criteria for the performance. Students might choose to include a rubric for each artifact to more clearly show how the performance met learning goals as well as serve as provide a structure for student reflections. Classroom work that is meaningful, tied to clear and demanding assessment, and constant dialogue between students and teachers fuels effective digital portfolios. Like any complex change you undertake in your classroom, start out simple. Before creating portfolios, add a self-assessment component to existing student projects to get them ready for the reflections required for successful portfolio assessment. You will also want to develop a structure for your portfolio to facilitate materials management and provide direction for the assessments you want students to include. You might develop a portfolio structure around Common Core State Standards or 21st century skills or a combination. You might also want to build assessment criteria and space for student reflection into the template. As students become more comfortable with portfolio assessment and reflections, you will see them trend away from including only their best work and begin to incorporate work that demonstrates growth. You can facilitate this change by continually engaging in dialogue about learning artifacts students might include and why. The process of choosing artifacts to include in a portfolio gets students to begin thinking about their learning. Including a voice reflection about why they chose a piece encourages them to move from the “what” of the project to the “how” of the learning process. 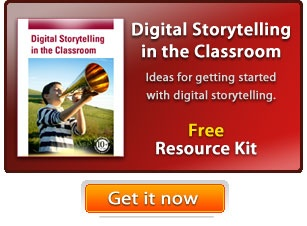 A digital portfolio is a great way to foster dialogue between student and teacher. As students develop expertise in selecting and reflecting, instructors benefit from a clearer picture of student learning and are better able to tailor instruction to meet specific student needs. The resulting awareness of their learning, and the discussions it generates between teachers and students, fosters an engaging and effective learning environment. Digital portfolios require a significant time and training investment for both you and your students, but students’ improved engagement and metacognitive skills will continue paying dividends long into the future.